If you find yourself in Toyburg, there's two people you can trust. The thing is though, they're not exactly people. Ruxby and Hazbrow are childrens’ toys who are thrown into a chilling noir cycle of murder, deceit and intrigue, where the horror of events stands in stark contrast to the bright and cheerful world in which they take place. They've previously appeared in Torsobear as part of the Outré anthology, but now they're hoping to get some more action, courtesy of Kickstarter. Expanding on the original short story, Yarns From Toyburg pulls a host of new and established creators into exploring the twisted world of Fluffy Noir. The toys of Toyburg blissfully enjoy their waking lives. Most will never encounter anything nasty. But when they sleep, all will experience the strange and sometimes disturbing violation of The Playtime. Sometimes, they remember. The book will be offered via a Kickstarter campaign and first week pledges will get a special extra reward of a sketch from the creator on the inside front cover of the book, in addition to any other rewards for their pledge level. The stories all welcome readers to the city of Toyburg, where the streets are teeming with crime, passion, and murders most foul. They are walked (for the most part) by grim detectives, burned-out has-beens, femme fatales and tragic heroes. 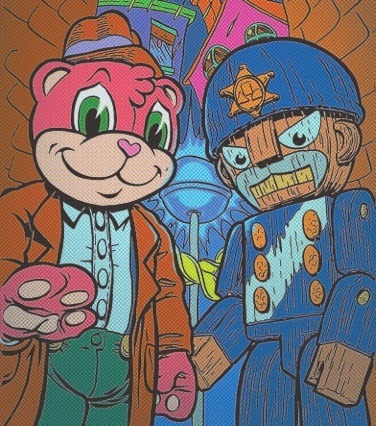 The dismembered bodies of teddy bears are being found in back alleys of Mindy Mile district, and it’s up to our hero, rookie detective Ruxby Bear and his partner officer Hazbrow to solve this string of murders, no matter how high and far the clues take them. Between cases, we take a look into the lives of Toyburg’s citizens, police and criminals. No matter where you turn, this city has something sinister hidden just behind the storybook surface. While the Kickstarter isn't live yet, you can sign up to get an alert when it is at brethren@hotmail.co.uk. Full press release below. Torsobear is a story about the inevitable loss of innocence in a brutal world, first created by Brett Uren, for the digital anthology, Outré. Expanding on the original short story, Yarns From Toyburg pulls a host of new and established creators into exploring the twisted world of Fluffy Noir. Torsobear introduced the character of Ruxby and Hazbrow, childrens’ toys who are thrown into a chilling noir cycle of murder, deceit and intrigue, where the horror of events stands in stark contrast to the bright and cheerful world in which they take place. The book will be offered via a Kickstarter campaign and first week pledges will get a special extra reward of a sketch from the creator on the inside front cover of the book, in addition to any other rewards for their pledge level. Welcome to the city of Toyburg, where the streets are teeming with crime, passion, and murders most foul. They are walked (for the most part) by grim detectives, burned-out has-beens, femme fatales and tragic heroes. Sign up to receive via brethren@hotmail.co.uk <mailto:brethren@hotmail.co.uk> to receive an email alert when the Kickstarter goes live. Contact any of the creators you may know to be put on the alert list so as not the miss the first week pledge reward.